When you need to download a program, you should do it at an official vendor’s website. If you download applications from third-party file sharing websites, sooner or later you will be assaulted by something like Ads By Betteronlinedeals. These pop-up advertisements are more annoying than dangerous, but they are highly intrusive and they can expose you to unreliable content. If you are a security-minded user, you will remove Ads By Betteronlinedeals from the system. To terminate these ads, you need to uninstall Betteronlinedeals adware application first, and then look for other potentially unwanted programs. The reason we recommend searching for unwanted applications is because Ads By Betteronlinedeals do not appear out of nowhere. 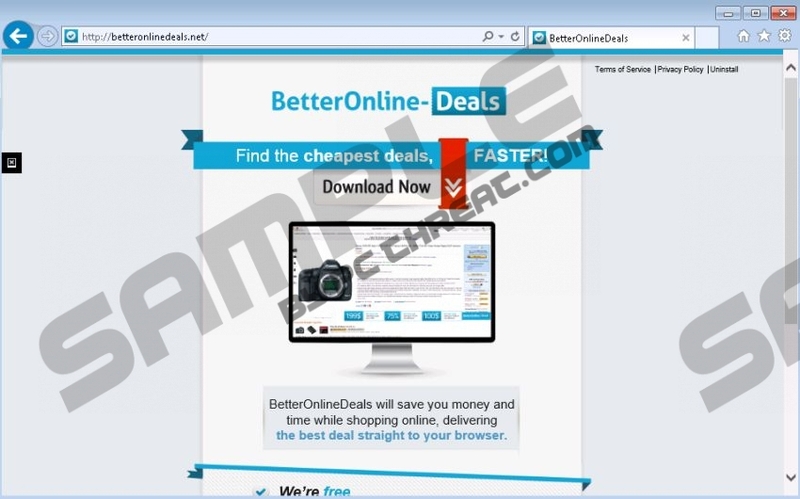 Betteronlinedeals adware application also cannot be downloaded from the official website because betteronlinedeals.net simply does not have the direct download link. This means that the adware application arrives at your computer bundled with freeware and other adware. It is not surprising because Betteronlinedeals belongs to the Lyrics adware family, and it is very similar to Boby Lyrics, Lyrics Fan, Lyrics Monkey, etc. All of these programs are known to be distributed with a list of potentially unwanted applications, such as Xtendmedia, Ad.Yieldmanager, Jollywallet adware and many more. Hence, if you see Ads By Betteronlinedeals pop up on your browser’s window, it is very likely that you have more than just one adware application on board. Technically, commercial pop-up ads are not direct computer security threat. It is the content you have to be wary of. Betteronlinedeals may say that it displays coupons and discount offers so that you could save money on your online purchases, but this program DOES NOT check the credibility of the links that get embedded in Ads By Betteronlinedeals. Thus, if this adware application ends up being exploited by a malevolent third party for content promotion, you should be very careful. You can never know whether the website you land on after having clicking Ads By Betteronlinedeals is safe or not. That being said, you should not take your chances. It is clear that Ads By Betteronlinedeals may present particular security issues and you should not tolerate them. You need to remove Betteronlinedeals from your system right now. After manual removal, scan the system with SpyHunter free scanner. It will help you determine what other unwanted programs are installed on your computer. Terminate all the potential system security threats, and then invest in a legitimate computer security application if need be. Also, should you have any further questions on Ads By Betteronlinedeals or your system’s security in general, you can always leave us a comment below this description. Open Uninstall a program and remove Betteronlinedeals. Go to Uninstall a program and remove Betteronlinedeals. Open Add or remove programs and uninstall Betteronlinedeals. Quick & tested solution for Ads By Betteronlinedeals removal.